An update was pushed to Google Maps this afternoon, bumping it up to version 9.3. 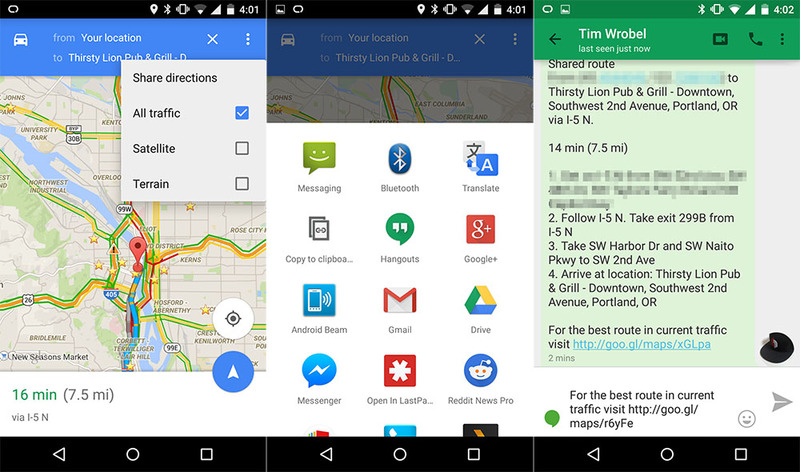 In the update, Google now allows for users to share directions to specific destinations through whichever app you choose, a feature which was previously unavailable. To do this, all you will need to do is select your location, choose a destination, then hit the 3 dots in the top right. From here, you will see a ‘Share’ menu pop up. This is where you will choose how to share the directions. You can assume a few bug fixes were also thrown into the mix. To download, you can either wait for the app to completely roll out on Google Play, or if you are impatient, download the APK and install it as you would any other 3rd-party app on your phone.